Just when you thought that things couldn’t get any worse, they did. Not only were they outfought, outrun and simply outplayed by a determined and confident Eastbourne Town side, but the Lions lost the services of striker Dan Simmonds, probably for the rest of the season, with a dislocated ankle! Pagham actually started the game quite brightly, with Liam Brady and Charlie Williamson both going close, but things started to go wrong soon after. A defensive mix-up on 21 minutes left Town striker Aaron Capon with a clear shot on goal from inside the penalty area and he took full advantage of it to fire his side one up. Eight minutes later the lead doubled when Andy Chick inadvertently headed an Eastbourne corner into his own net for 2-0. 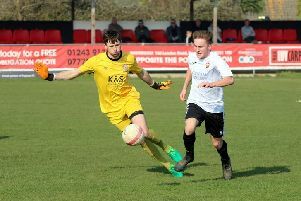 The game was all but finished on 33 minutes when Dan Bolwell scored the 3rd with a stunning 25-yard drive into the corner of Pagham’s net. Who are the longest-serving managers? The second half started with Joe Ashmore replacing Jack Hands, but it did little to stop the onslaught Town were throwing towards the Lions goalmouth. To make it even worse, Simmonds dislocated his ankle in a tackle and had to be taken off on a stretcher, to be replaced by Alfie Davidson. After 60 minutes Eastbourne notched their fourth after another defensive howler left Dan Perry clear through and he made no mistake from 10 yards. The closest Pagham came to scoring was when, in desperation, Harry Prisk, who had come on for Johan van Driel, tried his luck from a full 75 yards only to see the ball drop over the keeper and bounce 3ft wide. Eastbourne could and probably should have doubled their score before they scored a fifth, in injury time, when yet another mess-up by the defence presented Dan Perry with an open goal, and he wasn’t going to waste the chance. So, 5-0 then, Pagham’s largest home defeat for a long time. Pagham; Matthews, Williamson, Hands (Ashmore), R Davidson, van Driel (Prisk), Horncastle, Chick, Neighbour, Simmonds (A Davidson), Murfin, Brady.